Those of you with pro—or maybe just moderately complicated—home entertainment systems know how much of a pain it can be to manage the various remotes involved. Even worse is if anyone other than you wants to operate them; I had somebody watch my pets while on vacation and I came home to see the TV on and static buzzing because my poor friend just couldn't figure it out. 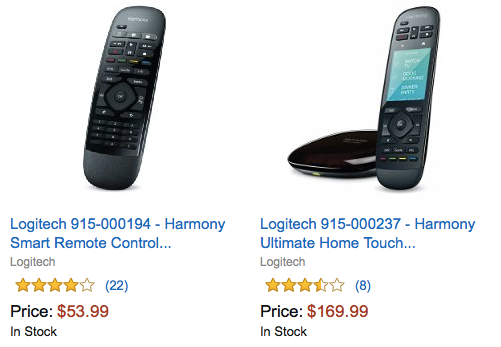 A universal remote like one in the Logitech Harmony series can make things much easier, so why not jump on board today when they are on Amazon's Gold Box daily deal? The first model, seen on the left for $54, has never been lower than $65 before (was also a one-day deal) and has otherwise ranged between $78 and $100, according to CamelCamelCamel. Buying new would run you $93 right now. The second model, on the right, dropped to $190 at the beginning of March and has been around there since. If you were to get it new, you'd be stuck paying $249. This model obviously has the benefit of the fancy touch screen but also control of smart home devices, which for some of you will be a very important added bonus. Both remotes can be managed via an app for easier setup and modifications. These deals tend not to last very long, so get them while they're hot!